Fringe cushions, sofas and consoles – oh my! No longer the design preference of musty old homes or twee bargain bin finds, the fringe trend has well and truly proven itself in the design community. Interior designers (including Natalia Miyar, Paolo Moschino, Louise Bradley and Martin Brudnizki) are joining the ranks of furniture and decor designers Ben & Aja Blanc, Munna et al in rethinking this age-old trend. From boho wall hangings to ultra-plush chaises this trend runs the gamut of design styles so there’s something for everyone. If you’re new to the trend (or apprehensive), fringe home decor will offer the look in a subtle way. For maximalists, there are great ways to incorporate the trend into your furniture designs. Read on for some of the best ways to use fringing in your interiors. This one is a no-brainer. Easy to do and playful without investing too much, fringe cushions are the training wheels of this interior design trend. 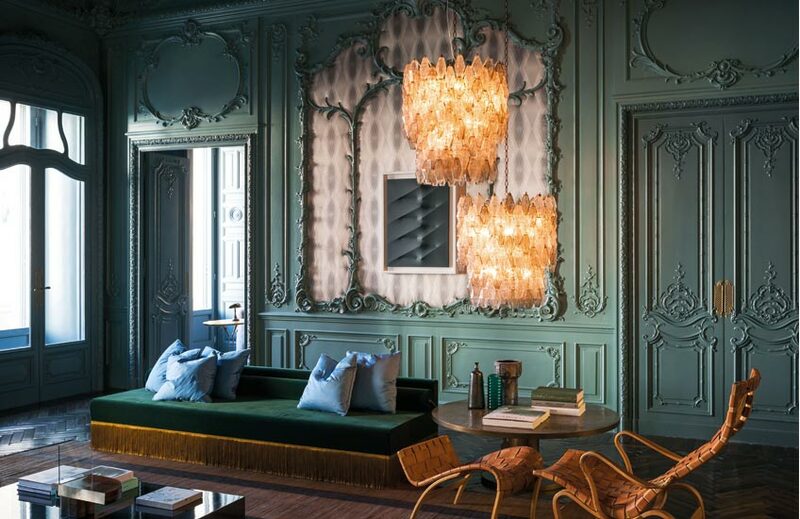 These tasseled designs have shown up in the projects of interior designers from for the past few years, reinventing the style and adding a touch of luxury in one fell swoop. Don’t be scared to try patterned fabrics with a complimentary or even contrasting trim or choose to be a little more refined with a plain fabric and matching fringe colour. 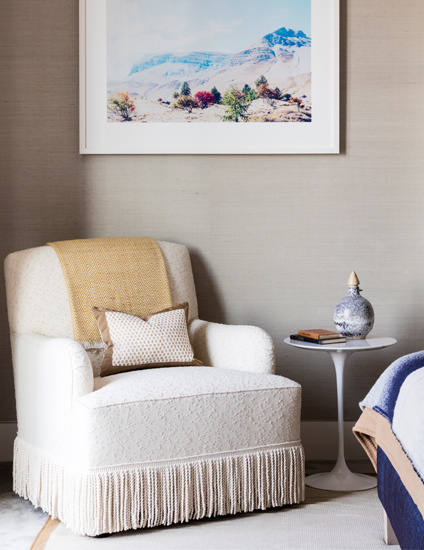 If you feel comfortable with fringed cushions, a fringed chair is probably your next step. 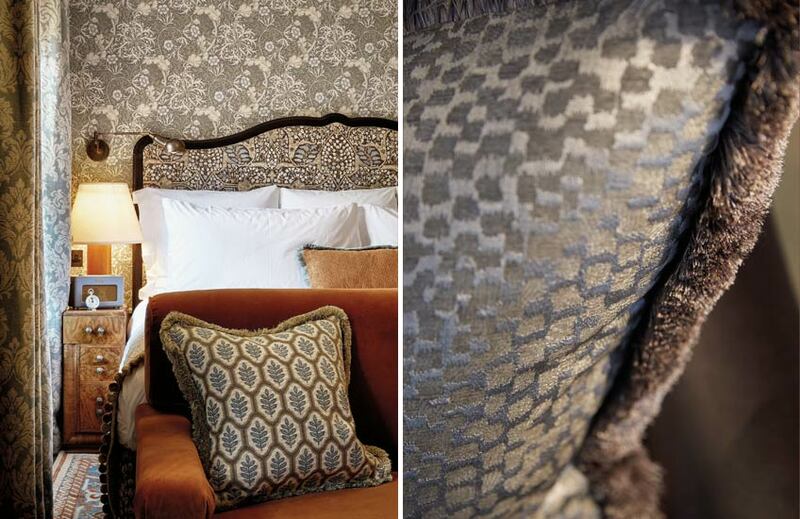 Fringed upholstery was a popular Elizabethan, Jacobean, Victorian and Queen Anne interior design trend but the modern take on the style features a more playful, tongue-in-cheek sensibility. Bullion fringed chairs add a certain unexpected vibe to a space which might otherwise feel safe in its design. These pieces surprisingly lend themselves to a variety of styles too from ultra-modern (stick with a simpler fringe and contemporary colour palette like the neutral bullion trim of this living room by Studio Ashby) to revival styles. Just make sure that the trim you choose is suitable for the pieces they’re destined for. Pay attention to proportions. Bullion fringe works particularly well when using a 1:1 fringe to cushion ratio or when using the rule of thirds – either one or two third of fringe to two or one thirds of cushion. Usability is important too. Vacuum cleaners can wreak havoc with extra long fringing. Another great way to incorporate the trend in a conscious way is in the form of sofa seat cushion fringe. It offers extra texture to the sofa design and interest to your overall space. As with bullion-trimmed armchairs, for newbies to the trend, it might be best to stick with a more contemporary palette and fabric-trim combination. Fringed seat cushion edging is best done with shorter brush fringe whose fibres are shorter and more easily retain their firmness. Because the front seat cushion fringing will handle a lot of wear, find a high-quality upholstery fringe from a reputable passamenterie supplier like Samuel & Sons and Houlès. Taking the trend to the next level, fringe furniture requires a real investment because the look is much more dramatic and fringed console tables is no exception. 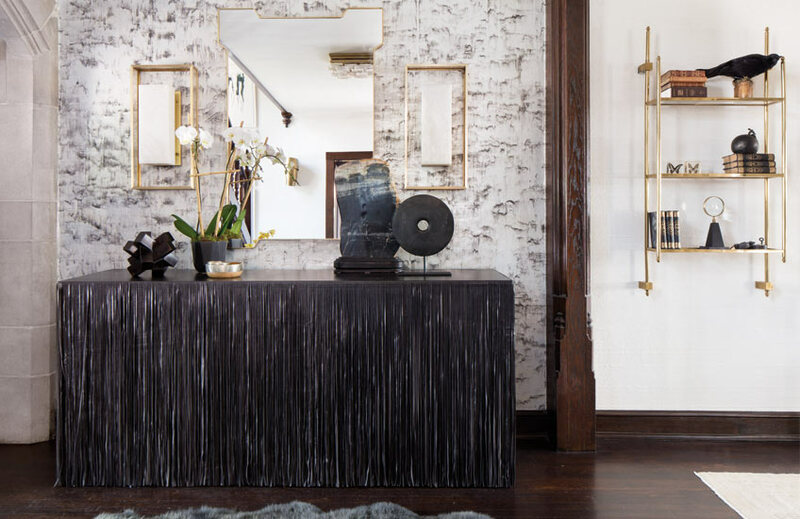 A fringed console’s long trim has a two-fold purpose – it can add interest to a console table and cover up open storage shelving, simplifying the look of your display. Feel confident in playing around with different materials and textures which will produce multiple effects. An edgy rock and roll, maximalist vibe characterises this Elizabeth Krueger console thanks to its floor-length leather fringe whilst a smooth silk cut fringe would give a console a glamorous makeover. Can anything be more glamorous than a fringed bench? These end-of-bed workhorses are a staple of many a bedroom but are often forgotten in favour of decorative headboards or cool bedside tables. Decorative fringing elevates a bench from staple bedroom piece to statement piece. The fringing accentuates the straight lines of a bench and disguises boxier, sturdy benches which can then be used for extra seating in a living or dining room when needed.